Hello again! Wow, on it aren't I? Two posts in a matter of days! To be honest I haven't got a great deal else to do as I'm off work for a week or so because I'm waiting for my CRB check to come through (another annoyance of working at an airport!). You will also be pleased to hear that I got a marketing internship after Thursday's interview. Though, in a strange twist of events, it isn't with the charity that I applied for. They (the charity) thought another candidate was better suited to the organisation; however one of the interviewers liked me so much that she wants me to intern at her company! I've been messing about on Photoshop as I'd like to get into editing my photos more and giving them more of a vintage look. Constructive criticism appreciated! 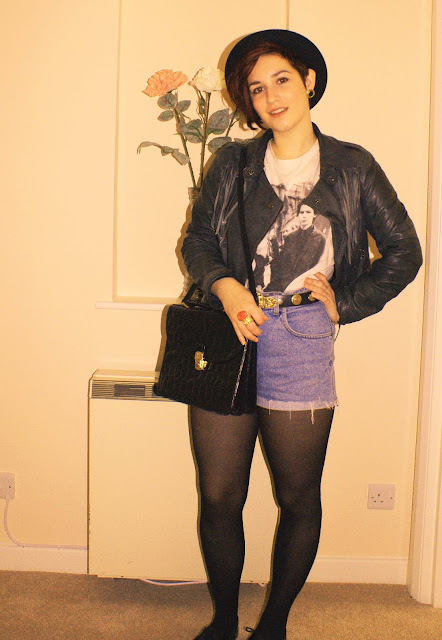 I love this bag and totally forgot about it, isn't finding old stuff in your wardrobe awesome? Yes so beauty! Not my usual forté ey? A little something about me: I love ANYTHING coconut flavoured/scented and I have scoured the earth (okay, several shops in England) for a decent, but not expensive (I still refuse to pay what the Body Shop charge for most of their smellies!) coconut shower wash.
Ladies... I believe I have found the answer. I spotted this new range in Bodycare and thought I'd give it a go. I got the shower cream at 79p (I believe) and the dry shampoo at, I think, £1.49. I can confirm that both products are excellent! The shower cream is amazing value for money- it's really rich, with loads of lather and smells amazing! The dry shampoo was impressive too. It's a bit cheaper than Batiste and smells really nice. To be honest I find some of the Batiste fragrances a bit sickly and overpowering but this one smells gorgeous. I'm converted! The brand is called Inecto (yep, never heard of it!) and unfortunately, neither of my products, from the 'Pure Coconut' range are on the website! I assure you that they're still in the Bodycare stores. I think I'll be trying the body scrub and moisturising lotion next. Hope you enjoyed my one off beauty tip! Hi Katie, I did enjoy the beauty tip! I'm a coconut fan too and a fan of cheapo (but nice) products. Do you know I've never set foot inside a Bodycare shop. Must rectify that immediately!! Love the outfit and the bag especially. And would definitely have applied for that job, though I think it's in London- as is usually the bloody case! You look amazing! love the hat and the cheeky shorts! Hi, for constructive criticism I'd only recommend changing the way/angle in which the photo is taken... It's best to Include full body, from head to toe, and try to get the top of the photo around a cm, or two, like you have done. For the the bottom leave only a tiny gap between the photo's bottom and the bottom of what you're taking the photo of. In this case your shoes. Source- 5 years photographer experience.